May 29, 2014 Kamiah, Idaho, and Antigo near Clintonville, Wisconsin - Four months ago in my February 2014 Earthfiles, COAST and Dreamland reports, I interviewed an audio technician in Kamiah, Idaho, not far from Lewiston. He had been sitting on his porch around 10 PM at night when he heard a weird, metallic sound above him. He said, “It was like a road grader with the blade down on asphalt or metal.” He looked up and saw a large, black triangular aircraft going overhead — each corner glowed with light. See 022714 Earthfiles. Wane: “There was this very large, dark triangular craft going overhead with three (reddish-orange) lights on it. That's where this (metallic scraping) sound was coming from!" 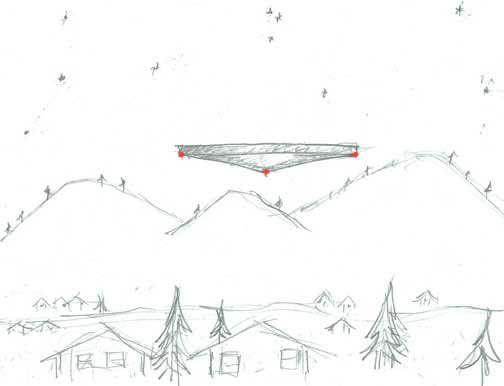 Wane's sketch of aerial triangle August 2009, Kamiah, Idaho. Next PostNext Plastic Microbead Trash from Oceans to Great Lakes Hurting Birds, Marine Life — and Humans?